Cabo San Lucas, B.C.S., Mexico, June 26, 2017 –(PR.com)– Mildred Vaca has been named the new Director of Sales and Marketing at Casa Dorada Los Cabos, Resort & Spa, joining a team led by Mr. Leonardo Perli, Hotel Director. 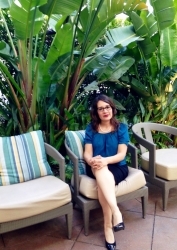 Originally from Mexico City and licensed by the Anahuac University, in Tourism Administration, Mildred has more than 20 years of experience in the hotel and tourism industry, actively participating in the development of new businesses for the industry at national and international level. Aiming to diversify markets, consolidate and develop new businesses, Mildred joins a team focused on continuous growth and collaborative work, which is why, quoting Mr. Perli, "makes a perfect match with the group." With an unparalleled location on Cabo San Lucas's best swimmable beach, Casa Dorada is just steps away from restaurants, entertainment areas and Cabo San Lucas Downtown. As a member of Preferred Hotels, a collection of the best independent luxury hotels in the world, Casa Dorada offers exclusive service in a family-friendly beachfront setting. 15 suites open to the most dazzling ocean view of Los Cabos, with bright, contemporary interiors that ensure maximum comfort and satisfaction.